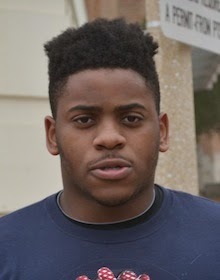 Shirts With Random Triangles: Texas A&M adds Texas high school defensive lineman Kingsley Keke to its 2015 recruiting class. Texas A&M adds Texas high school defensive lineman Kingsley Keke to its 2015 recruiting class. Kingsley Keke. Photo via Scout Football. Score another one for Texas A&M in the recruiting wars. Richmond, Tx high school rising senior defensive lineman Kingsley Keke announced his commitment to the Aggies via Twitter on Wednesday. Keke goes to George Ranch High School in Richmond, Tx. He is graded as a three-star defensive lineman by Rivals.com, which also ranks him as the 26th-best DL prospect in the country. He stands 6'3", and weighs 300 lbs. Keke becomes the 13th member of Texas A&M's 2015 recruiting class.